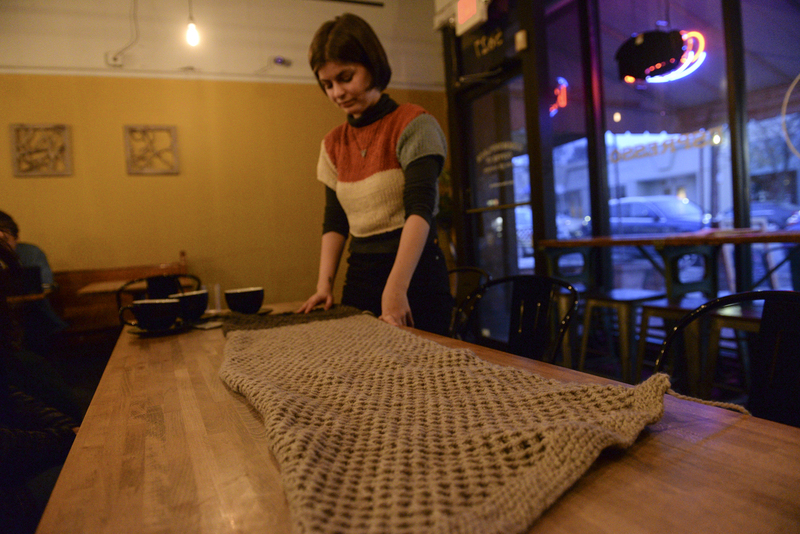 Chloe Baierl can be found holding a pair of knitting needles almost anywhere, including the first floor of the Cathedral of Learning, behind the counter where they work as a barista at Ace Hotel and even on the bus. 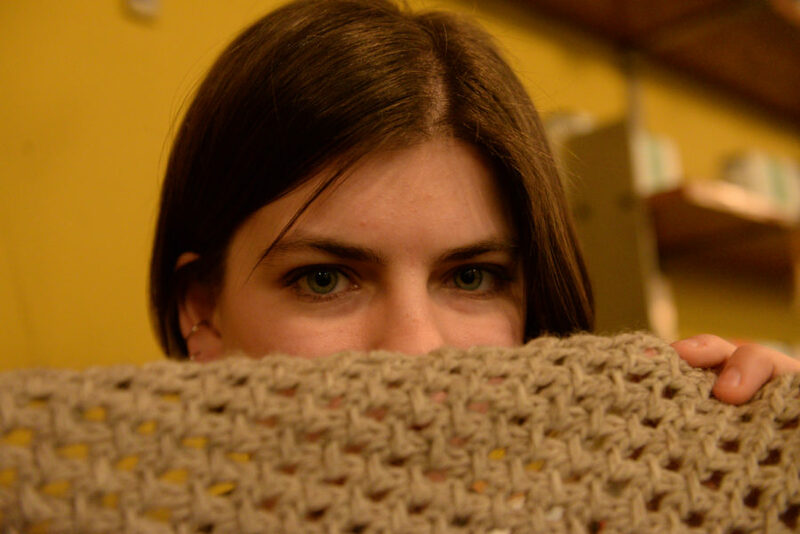 They especially enjoy knitting in coffee shops around Pittsburgh, their clear green eyes focused on the task at hand. Baierl began working at a Zeke’s Coffee after they moved back to their native Pittsburgh to attend Pitt after transferring out of American University. They have come to associate those environments with their return and readjustment. Baierl’s interest in knitting is genetic — they were inspired by their mother to pick up the art. Baierl’s mother, who was left-handed, struggled for a while to teach her right-handed child how to knit. It wasn’t until Baierl was 8 years old and their paternal grandmother from Tennessee came up to visit that Baierl finally figured it out. Their nana — right-handed — taught them in only five minutes. As a child, they knitted a lot but usually didn’t complete projects. They stopped in middle school, when they felt that knitting “wasn’t cool,” deciding it was “something that only grandmas did.” They didn’t start again until the end of high school as a way of improving their mental health. For Baierl, knitting became a therapeutic way of coping with the anxiety and stress they often struggled with. Baierl’s partner of three years, Geoff Bland, described Baierl as knitting anywhere and everywhere, with yarn sometimes tumbling out of their backpack. Bland is supportive of Baierl’s passion and together they are thinking about transforming their basement into a cozy studio space for Baierl to knit and store supplies. As a double major in English nonfiction writing and literature, Baierl has found a lot of parallels in writing and knitting. Like knitting, writing requires working with a larger framework in mind of a story they hope to create and explore. However, as they begin writing, this initial outline tends to change as more ideas develop. Similarly, knitting relies on initial planning that changes with progress. Baierl has even blended these two interests — last fall, they made a video essay for their multimedia class exploring how knitting brought them closer to their nana, whom they had previously felt estranged from. Baierl’s father, Bill Baierl, is especially pleased that his child has found a pastime that is good for their mental health and keeps them grounded in the moment. He said that Baierl was creative for as long as he can remember, always engaging in the arts since childhood. Baierl’s grandmother passed away in March 2016, but they feel that they carry a part of their grandmother’s life with the interest in knitting that was passed onto them. As their grandmother taught them, Baierl has continued to share their passion of knitting with friends and coworkers who are also interested in the craft. In high school, Baierl worked as a summer lifeguard, and spent their summers knitting at the poolside. They discovered they enjoyed using fine cotton or linen yarn to make thin, boxy, high neckline tank tops. They think this is because they prefer summer over winter, and knitting these lighter clothes reminds them of warmer weather which makes them happier. They taught the other lifeguards they worked with until knitting together became a summer routine. 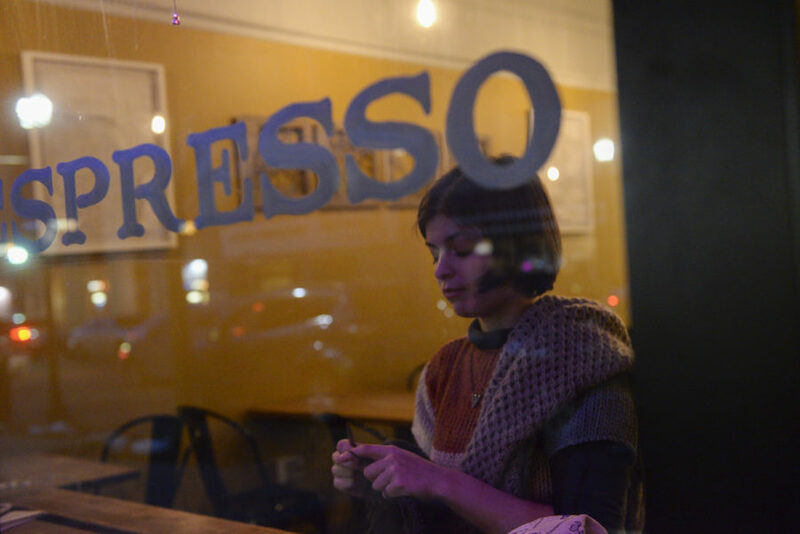 Baierl found a community of knitters while working as a barista at the Ace Hotel in East Liberty — their friend and former coworker Atiya Jones is a local artist who runs a knitting group on Tuesday each month from 6 to 8 p.m.
Bariel’s coworker at the Ace Hotel and fellow knitter Kaiti Jarose also finds Bariel’s passion very beneficial. The two of them often knit together at work. She is especially impressed by Bariel’s ability to create patterns essentially from scratch. Baierl sold their knitted products at their first flea market in February at Spirit bar in Lawrenceville, hawking winter beanies, wristlets and coffee cozies. They stick to basic primary colors and earth tones, never really gravitating toward bright yarns. They most frequently knit simplistic beanies and scarves. Right now, they’re working on a massive blanket scarf they started last January that was inspired by a picture they saw of Lenny Kravitz in his huge scarf. The hardest thing Baierl said they ever knitted was their first sweater, which took a couple months to complete. They would love to try to knit a bra someday and explore the notions of sexiness and “grandma crafts.” They’re also interested in treading a line between lower craft arts and the fine arts with knitting. Knitting in public spaces has given Baierl confidence in their passion, so much so that they feel people are not questioning or judgmental. A previous version of this story referred to Atiya Jones as Aria Jones.